A new type of space telescope could help find life on other planets or discover other solar systems like ours, according to a report recently carried out by the National Academies of Sciences, Engineering & Medicine. Stanford astrophysicist Bruce Macintosh, who was a member of the report committee, said the proposed telescope would directly image Earth-like exoplanets orbiting stars similar to our sun, and could work in conjunction with ground-based observatories to gather chemical data about exoplanet atmospheres. Stanford Report spoke with Macintosh about how the proposed telescope would work, what it's like to find distant solar systems and what we can learn by looking for habitable planets. Why did Congress ask for this report? 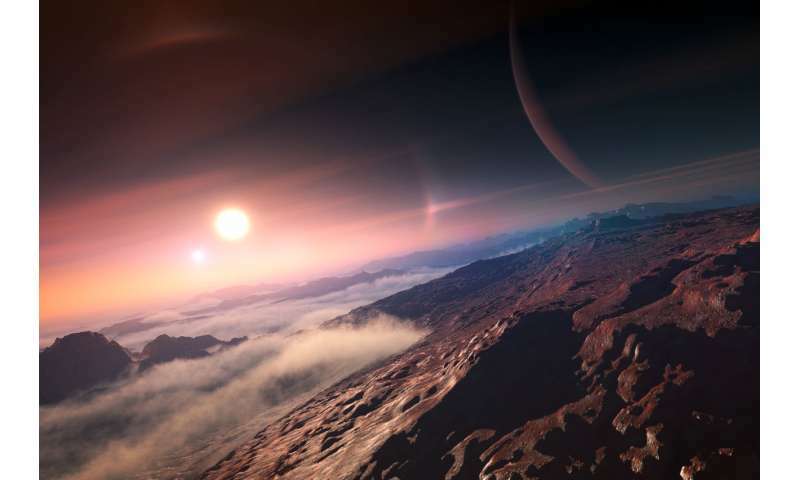 This report highlighted two key questions that will drive the future of exoplanet research. The big one is, are there other life-bearing planets out there? The other major question is, just how do planetary systems form and evolve, and is our solar system rare or a common part of that process? We now know that planets around other stars are pretty common, but we don't completely understand how those other solar systems form. In fact, we understand less about how planets form now than we understand about how black holes or neutron stars form. How are exoplanets discovered and studied now? There are several ways to study exoplanets. The dominant ones are what we call indirect techniques, where you don't really see the planet. The most common of these indirect methods is the transit technique. That's where the planet, as it orbits, passes in front of the star, blocking it a little as seen from the Earth and causing it to dim by a tiny amount for a few hours. But there are limitations to the transit technique. For now, it only lets you study the atmospheric details for giant planets, planets that are several times bigger than the Earth, because they have large atmospheres that absorb a lot of light. Also, the odds of it working go way up if the planet is close to the star and if the star is small, so it's a great way to study planets close to small stars. That's interesting, but it doesn't work for Earth-like planets around big stars and it doesn't work for planets far away from their stars at all. The other approach, which is what our group here does, is direct imaging. That's where you actually see a planet separate from a star. It's really, really hard because planets are millions and billions of times fainter than their stars. Right now, direct imaging only works for planets that are bigger than Jupiter and far away from their star. Currently, only ground telescopes are capable of directly imaging exoplanets. The telescopes we have in space aren't really designed to do this right now. A clear message from this report is if we're going to see planets like Earth orbiting stars like our sun, we need space telescope that are designed to do this. How would these telescopes work? There are two main approaches being considered. The first is what's called a "coronagraph" telescope, which uses mirrors and masks inside the telescope itself to create an artificial eclipse that blocks out starlight so that the little, faint planet next to it is detectable. The other approach, called a starshade, represents a different way of creating an artificial eclipse. To understand how this works, imagine that you want to see a bird flying close to the sun. What do you do? You hold up your hand and block the sun. A starshade works by the same principle, except it's space, so you have a giant space hand that's about 50 meters across and about 30,000 to 50,000 miles away from your telescope. This giant hand, or starshade, flies lined up between your telescope and the star so that the star's light is blocked and the planet can peep out around its edge. Every time you want to look at a new star, you move the pair of them around to point in a different direction. When they're operating, they have to hold their alignment to about a meter or so relative to each other. That's hard, but it's engineering hard. The physics is really easy. We can show that the shape of the starshade is crucial for making the shadow dark enough so that it really, really blocks the star. And some of us at Stanford are working on a microsatellite to test the concept. What would an exoplanet that has been imaged by one of these telescopes look like? We're not making pictures like the Apollo 8 picture, where you see the continents and so on. Right now, and for the foreseeable future, exoplanets imaged this way will still look like a dot – but it's a dot that we can use to measure a planet's chemistry and understand what it's made of. What can you learn about an exoplanet through direct imaging that you can't with indirect methods? Because you've blocked out the star, you're actually seeing reflected light from the planet itself, not just inferring it's there. And if you see light from objects, you can do what we call spectroscopy, where you look for the light signatures of particular atoms or molecules that are present in the planet's atmosphere. The hope is you'd see the signature of oxygen because we think the only way you can get a lot of oxygen in a planet together with other substances like methane is if something changes the chemistry of that planet and kicks it out of equilibrium. The reason we have oxygen on Earth is life. If you kill everything on Earth, then the oxygen will go away in a few million years. It's not impossible other planets could make oxygen on their own, but by far the best explanation we know of is the presence of life, so that's really what you're looking for is that signature of oxygen. When could the first of these planet-imaging telescopes launch? That's the less good news. We already have the next big space telescope, the James Webb Space Telescope, which is currently scheduled to launch in 2021. The next project beyond that is a telescope called WFIRST. The proposed planet imager would have to start after WFIRST. That probably translates into a launch in something like 2035 or even a little bit later. In 2015, your group discovered a Jupiter-like exoplanet using the Gemini South Telescope in Chile, and before that, you helped discover a four-planet system. What does it feel like to discover a new world? It's pretty awesome. We've had Kepler's laws for 400 years, but when we discovered the HR8799 planets, we were witnessing Kepler's laws in action – in a system with four giant planets that's light-years away. It's just spectacularly awesome. Why is studying exoplanets important? That's a legitimate question to ask. This is not knowledge that leads to concrete results on Earth, and we're not going to visit these planets for hundreds of years at least, but it's important to our perspective on the universe. Once upon a time, humans were the center of the universe, and then astronomers proved that we were not the center of the universe. That shifted, fundamentally, our view of how important we are, and how the universe doesn't really revolve around us, but we're still the only life we know of in the universe. If we discover that life exists elsewhere in the universe, that's a similarly epochal shift in our perception of how we fit in it. Or it's possible that life is really rare, and the exact circumstances that made Earth such a beautiful planet haven't happened in all these other thousands of solar systems, and we're the only one that got it right. That's almost as important to know. If we're the only habitable planet within 1,000 light-years, we really should do a good job of looking after this one habitable planet because it's even more precious and special than we knew. We could build the equipment that's needed to answer that fundamental question, but it's going to take us 20 years to build it, so we better get started now.